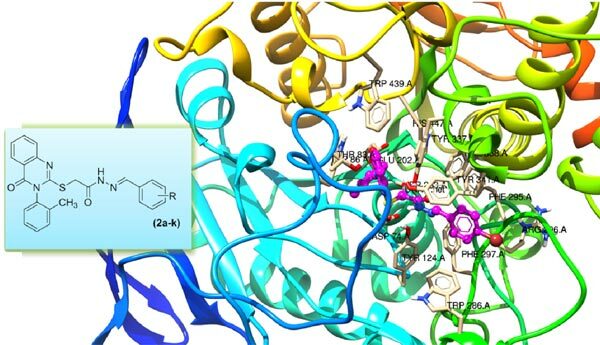 In an attempt to discover novel anti-cancer agents and potent cholinesterase inhibitors, 11 azomethine-dihydroquinazolinone conjugates were evaluated against lung carcinoma cells and cholinesterases. Most of the compounds exhibited significant cytotoxicity at low micromolar concentrations and were less toxic to normal cells. After 24 h incubation period, 2i showed maximum cytotoxicity. The 4-bromine substituted compounds showed higher acetylcholinesterase (AChE) inhibitory activity than other screened compounds. The most active compound 2c, among the series, had an IC50 value 209.8 µM against AChE. The tested compounds showed less inhibition against butyrylcholinesterase. Molecular docking studies were performed in order to investigate the plausible binding modes of synthesized compounds. The compounds can be further optimized to treat cancer and Alzheimer’s disease. These derivatives may open new pathways for introducing new therapies for curing cancer and senile dementia. Acetylcholinesterase, azomethine-dihydroquinazolinone, butyrylcholinesterase, cancer, lung carcinoma cells, senile dementia.